A common mistake in solving logic puzzles is simply looking for single true or false answers. Sometimes groups of wrong answers or empty squares can lead you to a deduction. In the example below we are showing how a double negative can lead you to an answer but this can also apply to triple negatives. 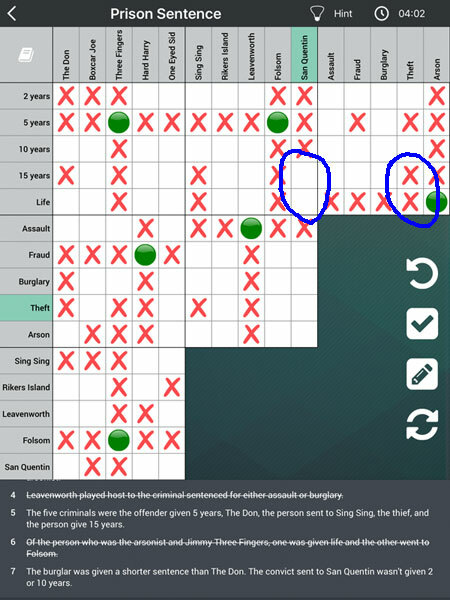 In the Prison Sentence example highlighted here we can see that the person at San Quentin either got 15 years or Life. If we look to the right we can see that the person convicted of Theft did NOT get 15 years or Life, therefore could NOT have been at San Quentin. We can therefore mark San Quentin and Thief as an X. Sometimes we get blinkered looking for single true or false answers and can sit there thinking a puzzle is unsolveable. It could be something as simple as a double or triple negative that could unlock the next stage. Good luck!